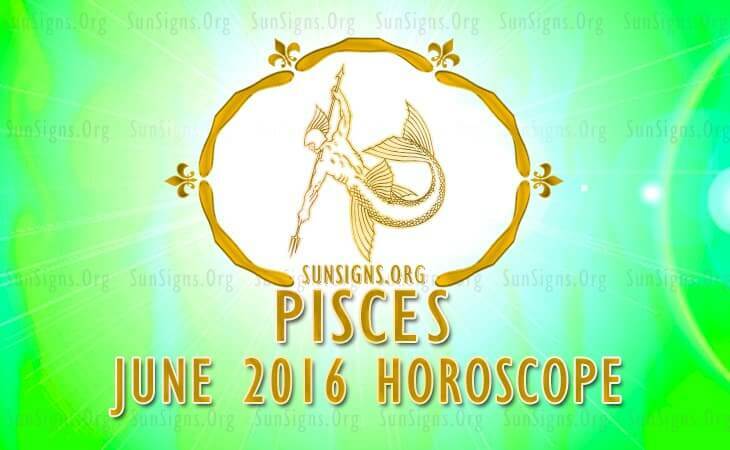 June 2016 Horoscope for Pisces indicates that family concerns and emotional stability will be vital this month. Career cannot be overlooked and you have the support of a strong emotional personality during this period. You can work on the future of your professional growth and formulate the necessary course of action. In June 2016 you will need to be flexible and adapt yourself to new situations and environments. The Pisces 2016 June astrology forecasts suggest that you should grab whatever vocational chances you get during the month. Business opportunities may arise while you are busy socializing or playing sports. If you are searching for a job, you will get chances to get employed. But you have to examine the suitability of the job you are offered. The Pisces monthly horoscope for June 2016 foretells that earnings will come through conventional ways from professional sources. Friends will be supportive of your monetary efforts. Money can be made by using technology and internet. Speculative investments should be avoided as they may not be profitable. Investments in precious metals and entertainment industry will yield handsome profits in June 2016. Love for the Fishes will be turbulent till the middle of June 2016. After that it will be more relaxed. Love opportunities are available at social gatherings or from online dating sites. Current relationships will be harmonious and sexually enjoyable. You will receive some news about pregnancy in the family. Single will be looking for pleasure and amusement in their new relationships. Pisces health requires watching for most of the month. A good lifestyle routine will boost your well being. To conclude, the Pisces 2016 June horoscope predicts a happy and joyful family life. Career and business might be a little slow.